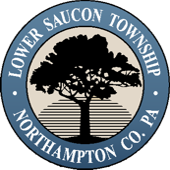 Saucon Township’s first permanent settlers were Nathaniel Irish and Issac Isselstein, who arrived between 1720 and 1725. Rudolf Oberly, Christian Labach, George Haertzell, Matthew Riegle, Jacob Sheimer, and other settlers predominantly bearing Germanic names followed them. Christopher and Simon Heller settled Hellertown, the largest of Saucon Township’s eighteenth-century settlements, in 1738. By the end of the century, the town had stores, three taverns, and 30 dwellings. Around 1725, Matthew Riegle and Jacob Sheimer established a settlement near the mouth of the Saucon Creek in what was to become the community of Shimersville. On the creek in the late 1730s, Nathaniel Irish erected the county’s first gristmill. In 1743, the Moravians in Bethlehem petitioned the Bucks County court for permission to erect a road from their settlement to the mill. Irish also built a dwelling house, sawmill, and land office and was the agent for the sale of lands to the Moravians in Bethlehem. Shimersville grew throughout the eighteenth century as the Lerch, Swartz, Transue, Henn, Knecht, Nolf, and other families moved to it and the countryside surrounding the hamlet. In 1801, Jacob Shimer, apparently a descendant of Jacob Sheimer, although he spelled his surname differently, erected a stone house near the mouth of the creek. In 1812, he and other family members purchased the Irish gristmill and erected an oil mill to its south. The family established other businesses within the area, including a fulling mill, which Jacob Shimer built in the 1810s. The mill was enlarged in 1829 and leased to William Chamberlain. In 1837, after Jacob Shimer’s death, his son George took over the operation of the fulling mill. John Knecht purchased the gristmill, which operated well into the nineteenth century. In 1842, a freshet destroyed a large portion of the frame fulling mill and its machinery. In 1844, George Shimer erected a new stone fulling mill. Prior to 1855, he added a woolen mill on the east bank of the Saucon Creek. The latter mill was inherited by William Shimer, who owned it in 1874. The mill is gone, but portions of its walls survive near the junction of Applebutter and Shimersville Roads. 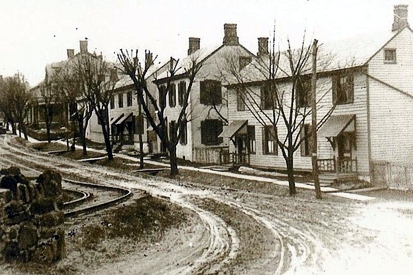 George moved his fulling mill business to Allentown in 1872. His Shimersville industrial holdings were converted into the Shimer and Company Foundry and Machine Shop which produced, among other things, scales and furniture hardware. Shimersville had developed into a small community by the mid-nineteenth century. The town center was located west of the current Conectiv (now Calpine) Energy plant on Applebutter Road. By 1851, the town included the mills, a store, a tavern, and several dwellings. The 1855 Scott map of Easton and its vicinity depicts in the town dwellings, Shimer’s Woolen Mill, Knecht’s Grist and Saw Mill, and a schoolhouse. The 1890 federal census reportedly included 20 dwellings, a schoolhouse, a blacksmith shop, and the fulling mill. Shimersville was likely the first town that the inhabitants of the Applebutter Road area turned for goods and services. For items not available there, they would probably have traveled on to Bethlehem to the west of Easton to the east. By 1920, the community’s heyday had passed. At that date, it was described as "a small gathering of dwellings that in the early days was a place of some importance." Beginning in the 1920s, with the expansion of the Bethlehem Steel’s industrial operations, Shimersville’s mills, houses, and other buildings were displaced by a substation, a water treatment plant, and the ever widening road network and associated bridges necessary to serve the steel and other local industries. But for a few mill walls, it has disappeared from the landscape.